The threat from fraud is ever changing. 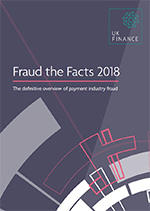 Fraud the Facts 2018 shows the extent and nature of the challenge faced – and one which the finance industry is committed to tackling. The financial services industry invest millions of pounds every year in advanced security systems to root out fraud. In 2017, £2 in every £3 of unauthorised fraud was stopped. That means a total of over £1.4 billion was prevented from falling into the hands of criminals. This is money that would probably have gone on to fund further criminal acts such as terrorism, drug trafficking and people smuggling.